Ajita (Skt. ; Tib. མ་ཕམ་པ་, Ma Phampa, Wyl. ma pham pa) — one of the Sixteen Arhats. At his birth Ajita had all the signs of great virtue. He and the daughter of King Prasenajit fell in love and, even though he was a commoner, Ajita gradually proved his worthiness to the king and they were married. The Buddha explained that in a past life they had made offerings to the Buddha Vipashyin who predicted that in a future life they would marry and then be attracted to the religious life. Ajita and his wife cut-off all worldly attachment and joined the Sangha. 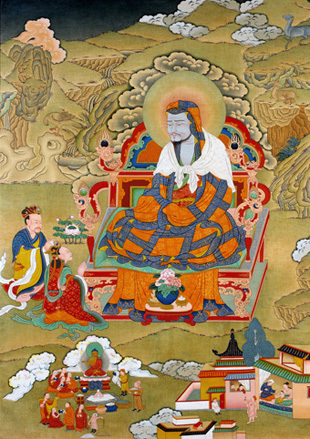 Ajita became celebrated as the most meritorious of the Buddha's disciples. He now dwells on Drang-song (the hermit-sage mountain), with 100 arhats. Seeing Ajita with his hands in the meditation mudra gives the ability to enter into meditation with moral perfection, and he grants protection and steadfast devotion to practice. This page was last edited on 26 January 2019, at 14:46.